Time: 7:00pm Day: Friday Doors: 6:00pm Ages: 18+ Ages Price: No Cover! Alex McMurray turns 50! Big Party! No cover! 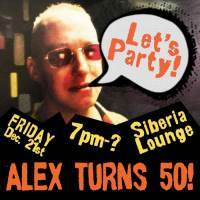 http://www.alexmcmurray.com/ All welcome! !